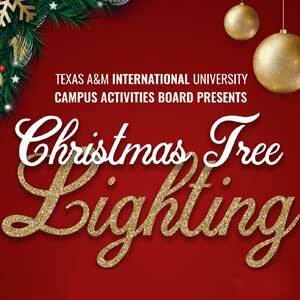 Usher in the holiday season during the Texas A&M International University (TAMIU) Annual Tree Lighting Ceremony Tuesday, Nov. 27 at 6 p.m. on the Sue and Radcliffe Killam Library Front Lawn. Organized by the Campus Activities Board, the much-loved campus tradition signals the start of the holiday season for many TAMIU students and the community at large. This year, guests are invited to take a photo with Santa Claus, enjoy entertainment and partake in free refreshments. Later that evening, the University’s Classical Guitar Ensemble will take the stage for the 18thAnnual “Guitarras de Navidad” Concert, at 7:30 p.m. in the Center for the Fine and Performing Arts Recital Hall. The concert includes a musical selection that draws from the sounds of the season. General admission donation for the concert is $5 to support student scholarships. Student admission is free. For additional information on the concert, contact Dr. Gilberto Soto at 956.326.3046, or email gsoto@tamiu.edu. For more information on the tree lighting, contact the Office of Student Orientation, Leadership and Engagement at 326.2280 or email sole@tamiu.edu.